Description - 6mm Energy rubber tiles are designed to be a low-cost rubber tile that is durable enough for any home gym and can be used in light duty commercial gyms. These recycled rubber tiles are available in center cut tiles in one popular all purpose color. The locks on these tiles are precision cut for a nearly seamless appearance and these tiles can be loose laid for an easy installation (no adhesive is required). Energy tiles can be cut with a utility knife and straight edge for wall to wall installations or to make square rubber mats using the tiles and like all of our rubber products, they are backed by a 5 year warranty. Note: Confetti will not interlock with Teal or Violet. Size – 24” x 24”. Weight – Each Energy tile weighs approximately 5 Lbs. 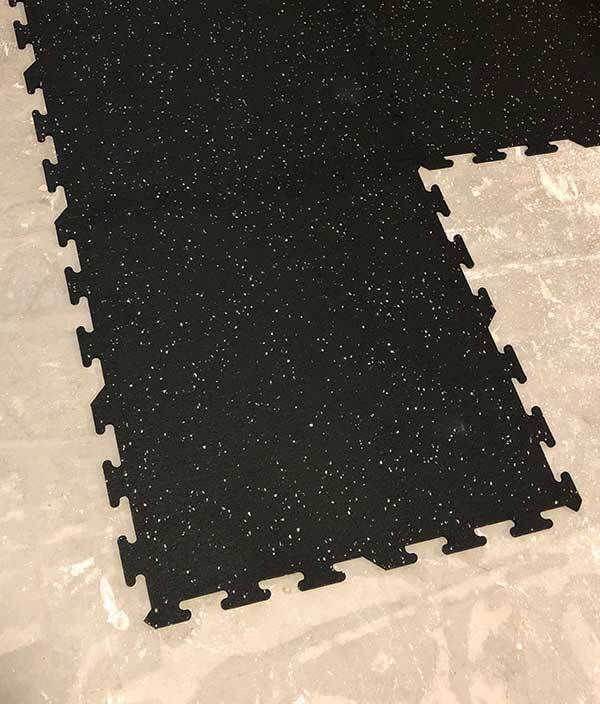 Recommended Uses – Energy interlocking rubber tiles are an excellent floor tile for use as flooring for home gyms and workout rooms, as commercial gym flooring in light duty gyms, as dog kennel flooring, as baement and rec room flooring, and anywhere else a non slip and shock absorbing resilient floor surface would be useful. Best value rubber gym tile. Tiles are 2' x 2'. 6 mm (approx 1/4") thick. Guaranteed durability and long lasting 5 year warranty. Confetti will not interlock with Teal or Violet. Our 6mm Energy Rubber Tiles do not have any data on sound attenuation, but they are tested for sound absorption and transmission. To get the testing results for these, please feel free to contact one of our customer service agents at 800-613-0996 and they will be more than happy to send it to you. Do these 6mm Energy rubber tiles include the border pieces? Our 6mm Energy Rubber Tiles only come in center tiles. To create border and corner tiles you will need to cut the tiles with a sharp utility knife and straight edge. I'm looking to use these for a home gym in a basement - the floor is currently concrete and I was wondering if this would provide enough support or if it's going to feel like I'm working out on concrete? Thank you in advance! 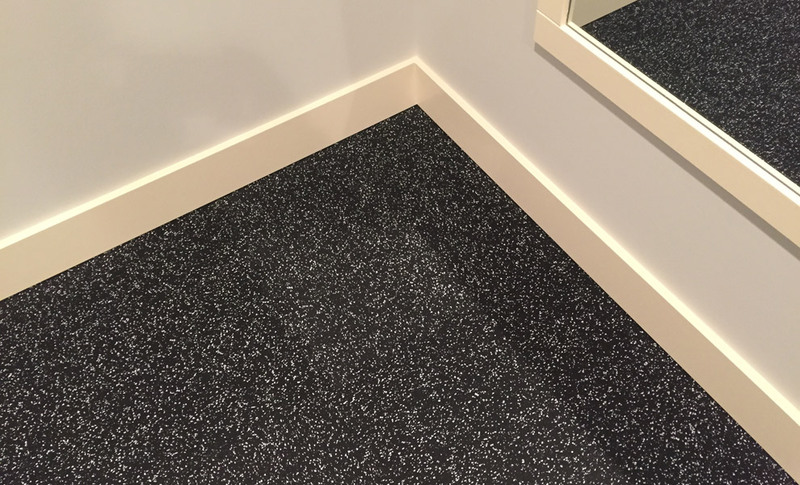 Our 6mm Energy Rubber Tiles will provide you with added comfort underfoot and shock absorbent over concrete. Are these tiles waterproof in any way if you have a spill? Our 6mm Energy Rubber Tiles are water resistant, not waterproof. When water is spilled it will sit on top of the tile initially. Over time, the water may seep into the pores that are on the floor and eventually evaporate. What is typically left behind are the salts in minerals that were in the water. Is this durable enough to drop barbells? Our 6mm Energy Rubber Tiles can handle the dropping of barbells on them. If the barbells are over 25lbs, we do recommend using a thicker rubber tile. I don't write reviews for products very often - if I do, it's because I was either very impressed or very disappointed with a product. In this case, I am extremely impressed with the 6mm Energy Rubber Tiles. The dimensions of the room I did are approximately 13' x 11'. I finished off a room in my basement for a home gym and installed them right on the concrete floor. I ordered 45 tiles (5 boxes of 9) and had 4 full tiles left over. I was very happy with the color fleck in the tiles (violet) which in my opinion appears more of a light grey than violet. I have grey walls, so the tiles matched the room very well. Install was a breeze, the fitment of the tiles are so precise that it's difficult to even see where the seams are. I needed to cut the final row to fit, which was just as easy. Took me about 1.5 hours. All that is needed is a sharp blade and straight edge, and the tiles cut straight in seconds. Very low rubber odor, almost non-existent. These tiles are plenty thick for home gym use. I can't say enough good things about these tiles, it looks like a pro installed them. If you're on the fence about getting them, you won't be disappointed! As advertised, and just like commercial gym flooring. 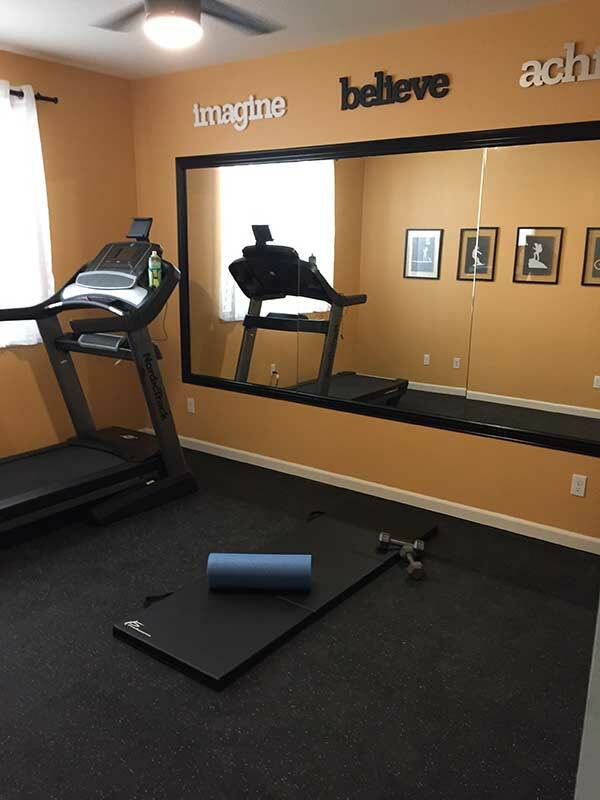 This rubber flooring is perfect for anyone who wants to set up a home gym in their basement. 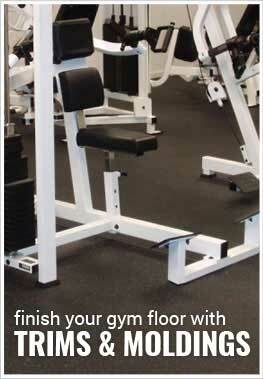 It provides the right durability for all types of exercise equipment. 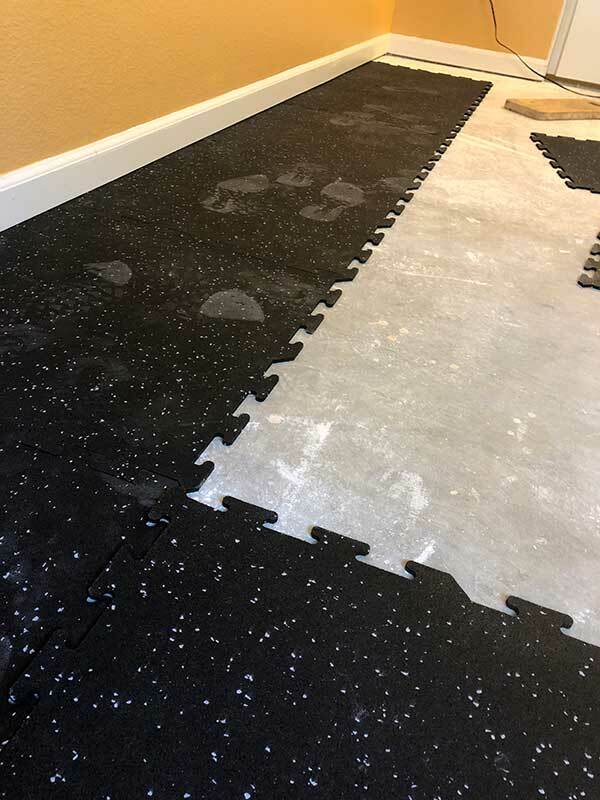 Install is easy and having it come in multiple, easy to connect puzzle pieces makes it possible to arrange the flooring the best way to fit your needs. Highly recommended! I did a lot of research before ordering the 6mm rubber tile floors for my home gym. You can’t beat the prices offered here and to keep within my budget I opted to go for the 6mm instead of the 8mm. You will definitely need a good cushioned mat to do certain excerises since the floor is hard. I went with the grey color which is essentially white color flecks. The website and samples process could use some improvement. There was not a sample of the 6mm gray and so I ordered the lavender, the olive, and an 8mm gray hoping it would be the same appearnce as which the 6mm would be. The company should have samples of all products and also better pictures and description of the colors. 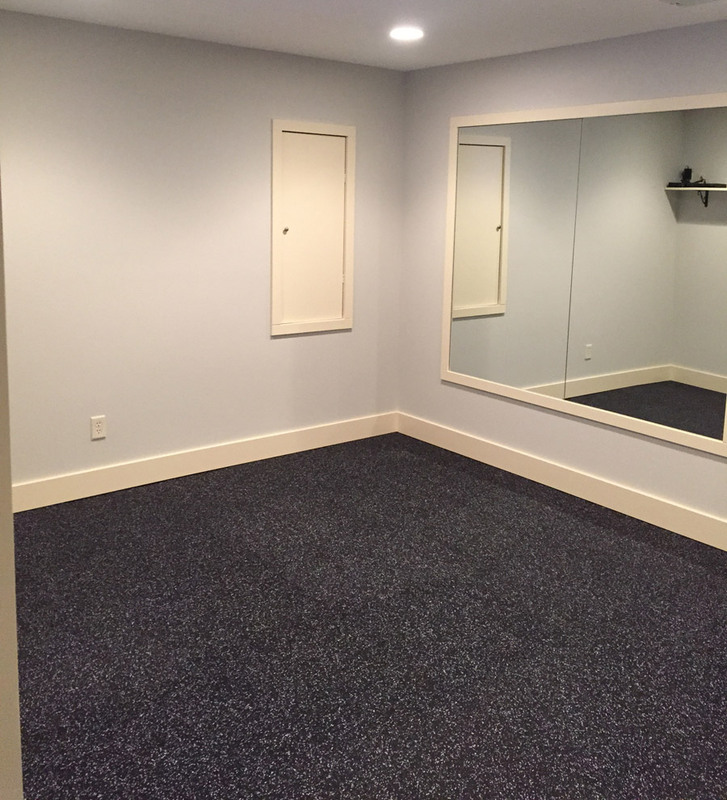 In the pictures the fleck percentage appears different between the gray and other colors and the pictures are so zoomed in it’s hard to pictures what the flooring looks like at a distance. Despite this hang up once I decided to order the product came quickly and I received alerts about shipping. The product took me a few hours to install in an approximately 10 x 14 room. The 6mm does not have straight edge pieces so you do have to cut those which is very easy with a good utility knife and a straight edge. I relived carpet and laid the rubber floor on cement. It tucked nicely under my baseboards. The floor does not separate during my workouts (interval training mostly). Be careful when vacuuming though. I had my vacuum on low pile and the corner of one of the tiles did pull up but fortunately the suction wasn’t strong enough to rip the tile. I’ve reveived compliments on the appearance of the flooring and you can barely see the seams.